Stuart Cameron has been working in media since 1978 producing and presenting Television and Radio programmes as well as promoting music acts all over the world via Hotdisc, his music promotion company which was launched in 1998. A former dual Scottish High Jump champion, he moved into sports broadcasting and journalism in his teens working in radio at BBC Radio Oxford, Fox FM, Radio Caroline and CMR Nashville as well as freelancing for newspapers and magazines. 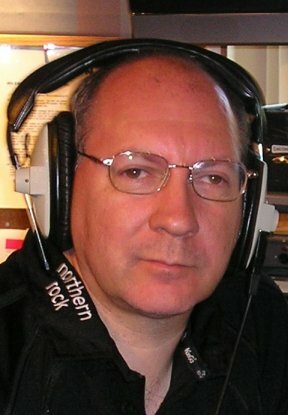 As a music promoter he staged many theatre concerts and events, worked with Sir Bobby Moore and Harry Redknapp at Oxford City FC in the promotions department and ran a successful entertainment agency before moving back to Scotland in 2000 to launch Scottish Rugby Radio then Borders Rugby Television. As a performer he has played many big venues in the UK, supporting the likes of Boyzone and Peter Andre and as an actor has appeared with Lynn Redgrave, Peter Davison and Samantha Bond in Film and TV productions. He has narrated many TV programmes and DVDs including Motor Sports shows for Duke, the leading Motor Sports Media company. Stuart is a regular on Radio Borders, BBC Radio Scotland and TalkSPORT, where he covered the last two Rugby World Cups in New Zealand and England. His Hotdisc Top 40 TV and Radio shows are syndicated across Europe every week and he is rugby correspondent for ITV Border, where he presents, films, edits and produces regular bulletins. He was producer for the award-winning Scotsman Rugby Show which won the top prize at the 2014 Scottish Press Awards in the "Innovation of the Year" category, while in the same year his "Borders Railway - From Start To Finish" radio show was nominated at the Bauer Media Awards in the "Innovation of the Year" category. The Six Series TV version of that project took nearly three years to make and is regarded as the most comprehensive work on the Borders Railway. The 34 episodes are now included in an 8-disc DVD Box Set. There's a film, "The Story of the Borders Railway" released - his fourth feature-length movie - the others being a docu-film following St Boswells Rugby Club as they made history by winning the Scottish Shield competition, a docu-film about Dennis Locorriere's solo comeback following many years fronting world famous rock and pop band, Dr Hook, plus another documentary on the greatest Hawick Rugby Team of all time. In 2017 the weekly European Hotdisc Country Music chart show for Sky TV's 24 hour Country Channel on Sky 376, FreeSat 516 as well as FreeView Channel 87 completed 100 editions on air, while another project saw him producing weekly TV coverage of BT National League 1 for Scottish Rugby Television. In 2018 he was contracted by ITV Border to produce a series of 10 half-hour programmes under the title "Border Sport In Focus" covering Rugby, Horse Racing, Athletics, Football and Motor Sport among other sports. Another project for 2018 is the completion of a film about the final days of well known Scottish singer and broadcaster Jackie Storrar, who sadly died of cancer at the age of 50. He brings a wealth of experience to StuMedia, where he is undertaking a variety of different projects as a media and PR consultant and video journalist specialising in news, documentaries, music and sport. His TV and radio production company covers sports events as well as producing TV and bespoke programming. Stuart has launched "Golden Memories" which can best be described as a cross between "This Is Your Life" and "Desert Island Discs." It gives people the chance to put someone in the spotlight, be interviewed about their life, with the result being a television programme on DVD which makes the perfect gift for loved ones. It brings to life a person's story focusing on special moments in their life providing families with a unique gift which can be handed down to generations.